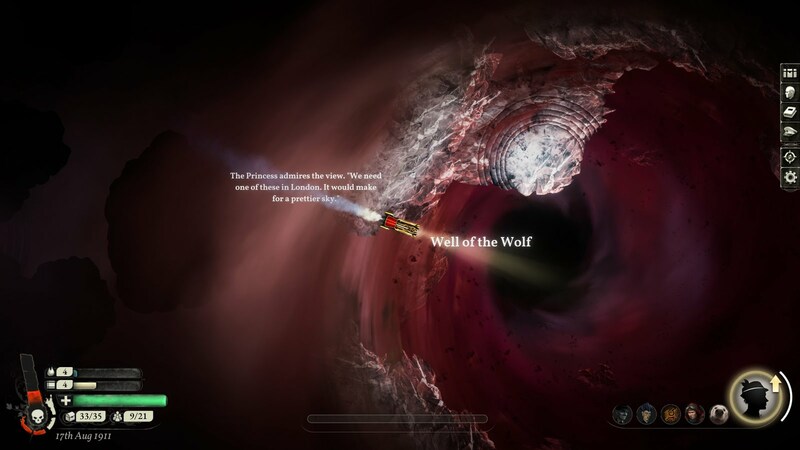 It's been about two weeks since my first victory in Sunless Skies! At first I thought I would be writing this follow-up post very soon, as it seemed like I might achieve my second victory within a couple of days. But it ended up being a classic 80/20 situation, or here maybe closer to 95/5: That last little bit proved excruciatingly difficult to wrap up. That took the wind out of my sails a little (or perhaps the coal out of my boiler? ); but for better or worse, I've played an enormous quantity of the game as I stretched towards the finish line, and have a better understanding than before of what makes it tick. Before delving into my experience writing the Song of the Sky, here are some of the mildly exploity things I've noticed in the game. I'm not sure if they're considered cheating or not, but they may be worth considering if you're facing frustrations. Most UI buttons are grayed out while you are in a complex storylet, so you cannot interact with your Hold or Officers or anything. However, if you already have one of those panes open before beginning a storylet, it remains accessible. This means that, for example, you can reassign Officers mid-story in order to raise your stats for a particular challenge. This won't take effect if you are already at the challenge point, but often you can see the odds, change your Officers, choose a branch that loops around, then pick the challenge you want with your better stats. 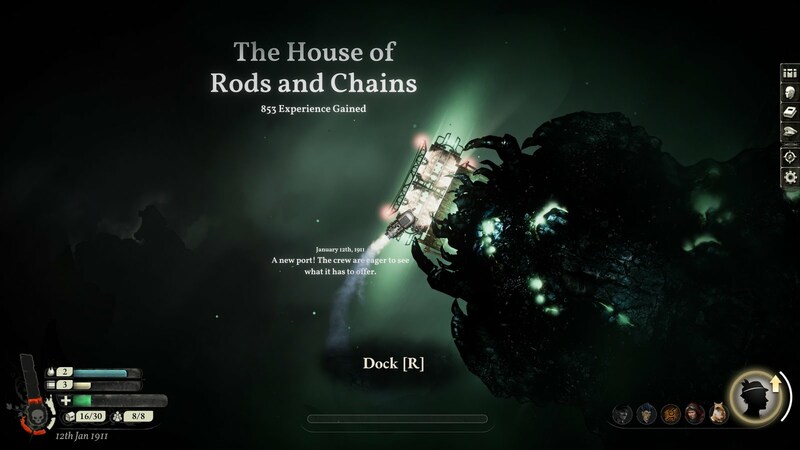 In Sunless Sea, enemies would drop aggro when you approached a port and would stop chasing you. Not so in Skies! They will gleefully follow you as you dock and continue firing weapons at you all the while. You won't actually take damage while in dock, but your hull will get hammered as soon as you leave. 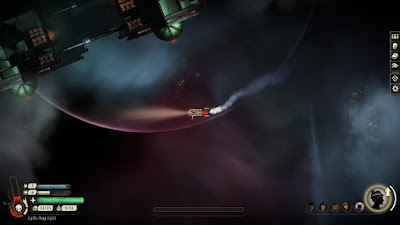 Fortunately, in Skies all enemies despawn when exiting the game, and the game autosaves while you are in the station. 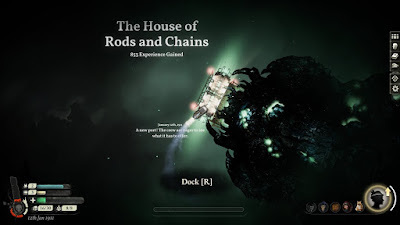 So: just dock, return to the main menu, then Continue. 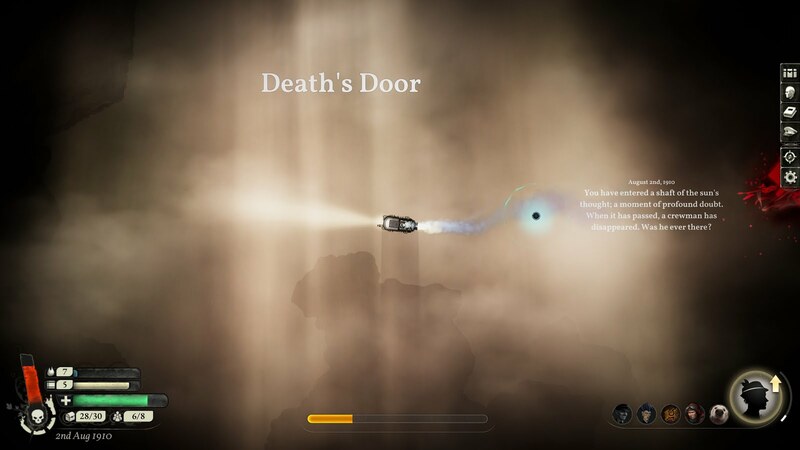 This incurs a brief loading time, and clears away those pesky enemies. This isn't often necessary, but I made extensive use of this in the Blue Kingdom. 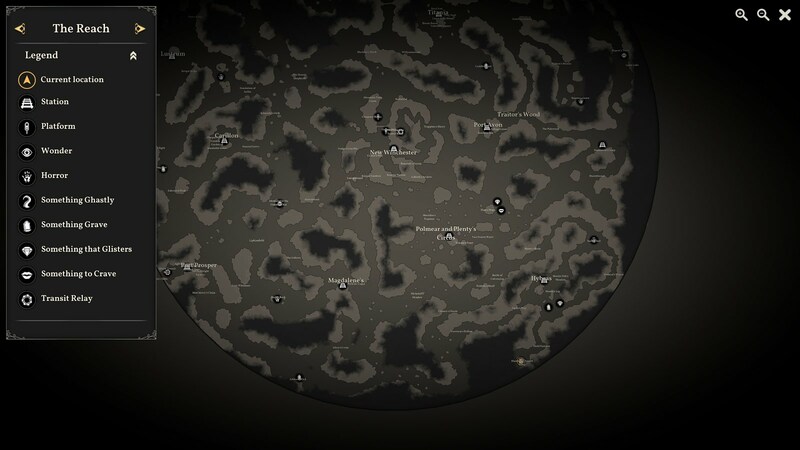 The map is randomly generated in each game. I'd assumed that it was generated at the start of a new game. Not so! 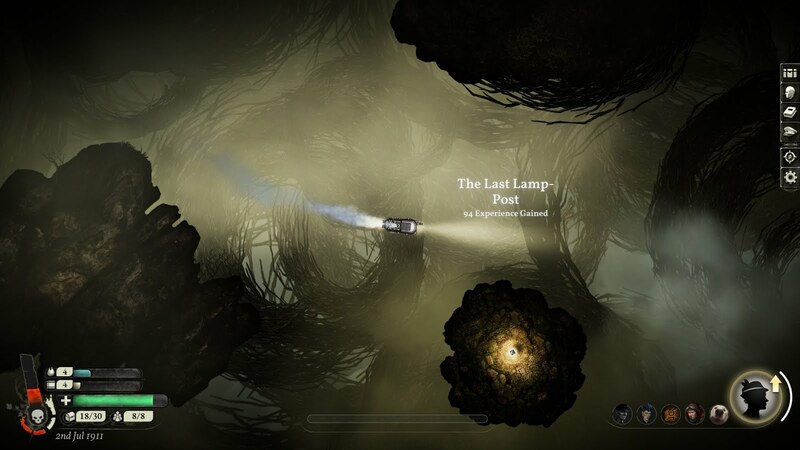 Undiscovered locations are reassigned each time you load a game, and only lock into place when you explore them for the first time. This is most obvious when you read the directions on a Prospect for a station you haven't yet discovered. For example, it may say that Lustrum is a far way to the north-northwest. 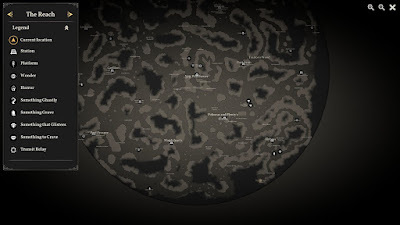 After you exit and restart the game, it may say that Lustrum is a far way to the east-northeast. And, in that game, sailing east-northeast will, in fact, uncover Lustrum. There isn't much you can do with this on an initial Lineage, but I think it could be especially helpful on subsequent Lineages since you can coerce the map you want. 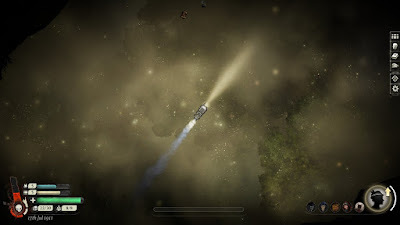 For example, you may want to place Port Prosper near Hybras to speed up journeys between Albion and Eleutheria; or you may want to place Titania near Port Prosper if you're planning to do a lot of smuggling; or you may want to evenly space out the Stations selling both Fuel and Supplies to always have one at a reasonable distance from any point. 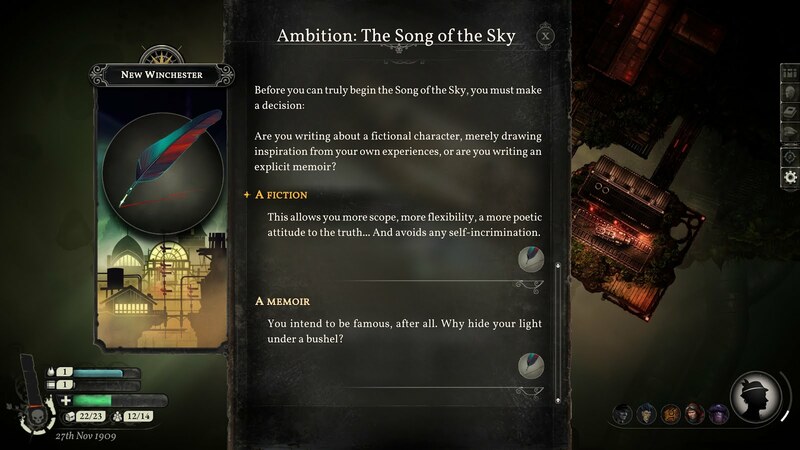 So: After becoming wealthy in the, er, Wealth ambition, I decided to try and become famous in the Song of the Sky. I believe this is a parallel to the Zong of the Zee ambition from Sunless Sea, which I don't think I ever did. For the most part, I really loved the Song ambition. Mechanically, it is kind of inverted from Wealth. 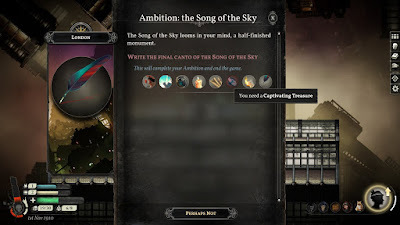 With Wealth, you had very specific early goals along the way (raise X Sovereigns, then raise Y Sovereigns), culminating with a wide array of possible goals for the very last step (one might focus on Searing Enigmas and Affiliation: Academe while another focused on Crimson Promises and Affiliation: Villainy). 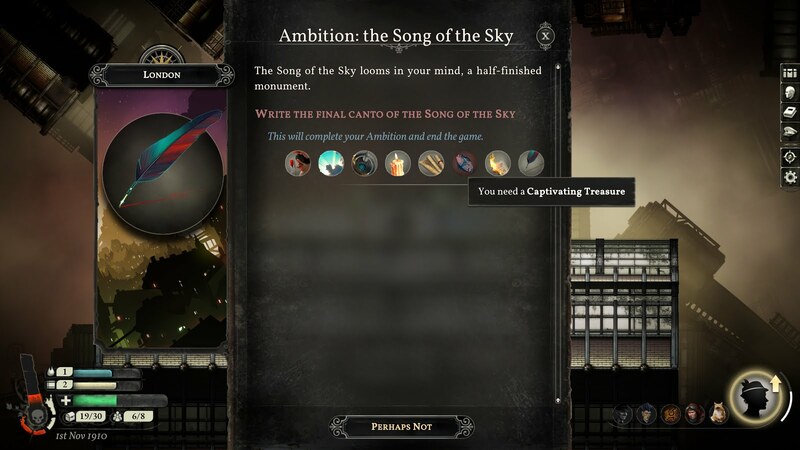 The Song ambition has a really nice cadence to it, alternating between possession-acquisition stages (acquire Visions of the Heaven and Savage Secrets, then a Cryptic Benefactor and a Moment of Inspiration, for example) and achievement stages. Those achievements were my favorite parts. Basically, you would need to do something noteworthy, and then write about that. You can see the whole list of possible options, which I think has over a dozen possibilities on it. Some of these are really intriguing, like having all three gods angry with you at once, or being subject to all four Well-rites. A lot of them were things that I had done on previous captains, which helped make this a relative breeze: for example, I could see that there was an option for sparking the revolutionary uprising in Brabazon, so I made sure to complete that storyline while I was in the area so it would be available for a future canto. Like I noted up top, this part of the game cruised right along. 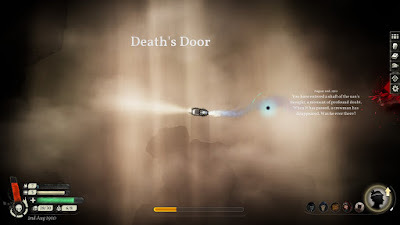 I'd retained a good number of Possessions from my previous run, and could plan out what accomplishments to accomplish, so within a couple of real-world days I was the toast of the literary establishment, had made my publisher into a very wealthy man, and had decamped from New Winchester to London to achieve still greater heights. And then... it all came skidding to a halt. The freedom of advancement in the early stages ends with a daunting list of ingredients for the seventh and final canto. Specifically, a single item on that list: a Captivating Treasure. 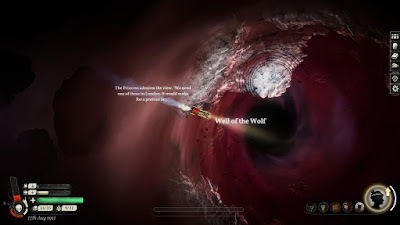 By that point I had been playing Sunless Skies for three weeks and hadn't seen a single Captivating Treasure. "Oh," I thought, "I'll just keep on doing stuff, I'm bound to stumble across one sooner or later." And still I haven't found a single "real" Captivating Treasure. This kind of soured my experience a bit, since I was doing all this cool stuff for the first time in the game, but instead of going "Oh, this is neat!" I was going "You have got to be kidding me! I still don't have a Captivating Treasure?! After ALL THAT?!?!" So, yeah! 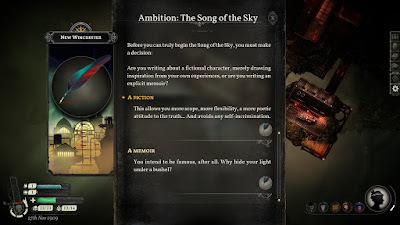 I was planning to press ahead with one of the two more story-oriented Ambitions next, but after the fruitless grinding of the last two weeks I think I'm going to take a break from the skies for a little while. When I do pick it back up again, I'll be happily starting from a very strong position with a large bank account, ample experience, an infernally powerful engine and a detailed mental map of how to navigate all of the various regions. It is probably the coolest-looking region of the four. All four look great! But it probably looks the best, especially the mirrors-and-fire islands. Scorn-Flukes are very rare, at least they were in my game. I'd read online about something cool you can do after defeating one, but went for more than a week of real-world time (over a year (!) 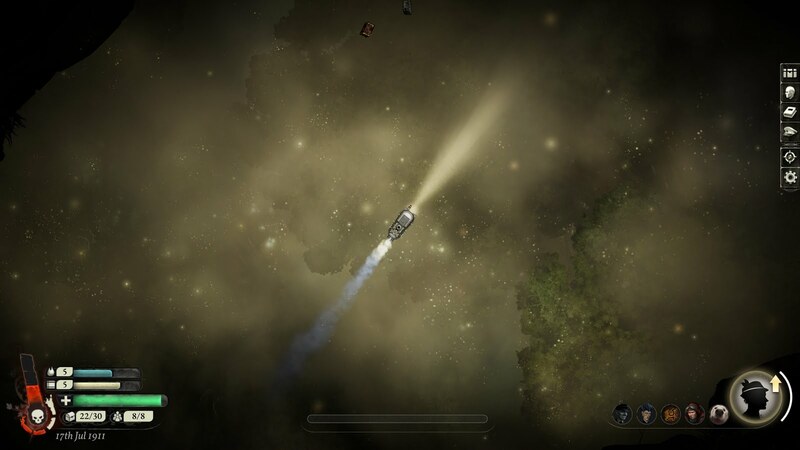 of in-game time) flying around Eleutheria without ever encountering any. After asking for help online, someone advised me to focus on Langley House, which eventually proved fruitful for me. The atmosphere is incredibly well-done. 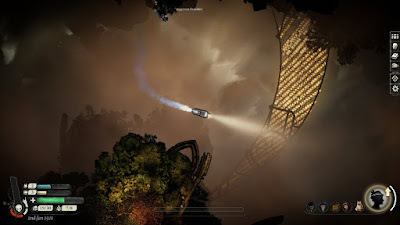 Not just the visuals, which are great, but the scene-setting in each station is very distinctive and almost viscerally powerful: whether the subdued wistful longing of the House of Rods and Chains or the body-horror tortures of Piranesi or the uncannily bright and bustling Langley House or the quiet and mysterious Caduceus... maybe even more so than the already-great stations elsewhere, the ones in Eleutheria really stood out to me. Hm... maybe I'll write a bit about my current understanding of the backstory. 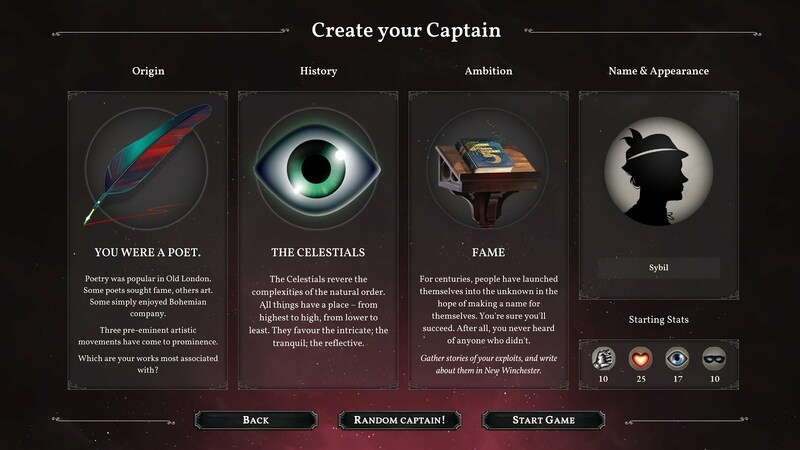 I'm writing this off the top of my head as a long-time but relatively casual player of Fallen London and Sunless Sea, without consulting any online sources, so I've likely messed up a lot of this, but it's the framework currently in my head at this point of the game. As we all know, stars are Judgments, and they make the law wherever their light shines. For many years London dwelt in the Neath and was free of the Sun's laws. While the Traitor Empress Victoria brooded on her family's fortunes, a rogue faction of her Admiralty started work on an ambitious project to construct their own artificial sun: the Dawn Machine, which would impose their own laws upon the Neath. Meanwhile, certain revolutionaries aimed for a grander strike: abolishing all natural law throughout the universe by destroying the stars. London allied with the Khanate, another powerful empire in the Neath, and together streamlined the technology to bring people through the Horizon and into a new star system, which they named Albion. 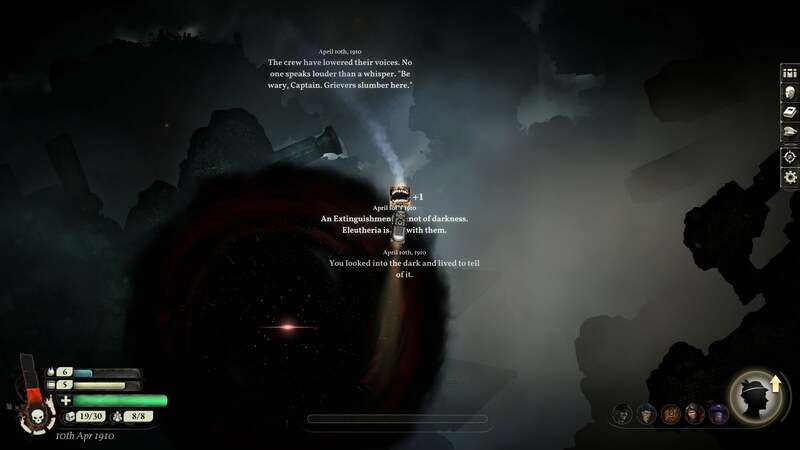 Albion contained many wonders, including Hours: time frozen into minerals. Incorporating this into new technology, the newly spacefaring British Empire was able to, for example, create faster-than-light travel (by directly manipulating time). Much of this pioneering work was done by the team of Singh and Jenkins, who at considerable risk and effort discovered how to create Relays, which could connect distant star systems. A newly reinvigorated Empress Victoria led her people into Albion. She and the revolutionaries shared a common enemy: the Sun of Albion. With the revolutionaries' well-known aptitude for constructing explosives, they jointly developed an Unclear Bomb, a star-killing weapon. Albion's Sun was slain... but perhaps not by that bomb. Victoria had fashioned the Throne of Hours: with so many mined Hours, she can effectively turn back time after any setback, ensuring she always makes the best decision in any situation. With Albion's Sun dead, the Admiralty's long-planned project came to fruition: the Clockwork Sun, building on the prototype of the Dawn Machine, now oversaw the law in Albion. It is a powerful tool, but still flawed: the Clockwork Sun is already decaying as entropy sets in. Still, by this point Victoria's ambitions and influence had vastly increased: no longer content with ruling a single star system, she began establishing colonies, outposts and embassies elsewhere. Now more a god than a human, she has largely transcended the petty concerns of her subjects and is dealing with powers higher up the Great Chain. OK... I think those are the most immediately relevant parts of the timeline linking FL/SuSe to SuSk. There's a lot of other cool deep lore, like the Halved of Eleutheria and the Devils and all sorts of stuff... but those are more about existing, ancient stories into which humanity is now wandering, I may or may not write about those later. This game has been occupying a lot of my mind lately! I'm going to take a little break to decompress and focus on some other stuff, but I'm sure I'll be back before much longer to uncover the mysteries of the other ambitions.